শিয়াল Upfronts. Chris Colfer, Darren Criss, Jane Lynch, Jenna Ushkowitz, Kevin McHale, Lea Michele, Matthew Morrison. At the শিয়াল Upfronts.. HD Wallpaper and background images in the স্বতস্ফূর্ত Cast club tagged: glee cast chris colfer darren criss jane lynch jenna ushkowitz kevin mchale lea michele matthew morrison. 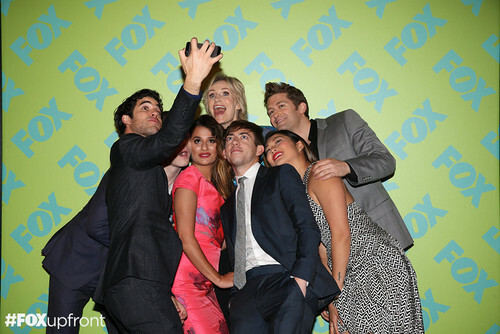 Chris Colfer, Darren Criss, Jane Lynch, Jenna Ushkowitz, Kevin McHale, Lea Michele, Matthew Morrison. At the শিয়াল Upfronts. This স্বতস্ফূর্ত Cast photo might contain ব্যবসা উপযোগী.